If the clay is not causing water logging, but you want to improve the structure and break up hard soil to make digging and planting easier this article may help. If waterlogging is the problem go to my lawns and garden drainage page. Clay soil can be a good thing many plants grow well in it. Clay soils are hard to dig, but retain moisture better than sandy soil. Drought is much less damaging on clay soils than others soil types. Clay is rich in nutrients plants need to grow, holding calcium, potassium, and magnesium. 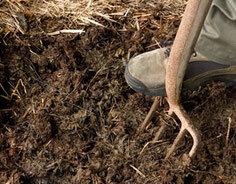 Improving the soil to make it easier to dig is a better and cheapest option than replacing it. I'll show you how lower down on this page. Clay soil is composed of mostly clay particles. Ordinary clay soil contains about 30 percent fine clay particles. Soil that consists of over 50% clay particles is referred to as heavy clay. Clay soils take longer to warm up in spring and clay soils are easily damaged when dug or walked on. What is bad about clay soil in my garden. Clay soil can be a nuisance, even if it's not waterlogged. Hard clay soil is hard to dig and although many trees and shrubs grow well in clay, the roots of some annuals, perennials, and vegetables, especially root crops like carrots and turnips can't grow through heavy clay. Clay soil is slow draining, slow to warm up in spring and compacts easily into large hard lumps of soil making it difficult for plant roots to grow. In dry weather the surface cracks up. What's good about clay soils? here to understand a little more about calcium, potassium, and magnesium in garden soil. Frequently asked Questions about improving and breaking up clay soil answered on this page. What are the problems associated with having clay soil in a garden? How can I improve and break up clay soil? When is the best time of the year to dig clay soil ? Recommended tools and materials further down this page. The best way to improve and break up clay soil long term. How soon can I plant in the improved clay soil. Can I improve and break up clay soil myself? YES, it is possible, with some hard work, to make clay soil more workable and suitable for planting and growing most plants and at the same time keeping the good things about clay such as the nutrients essential for plant growth. Clay also has moisture retention properties which can be useful during long dry spells. Improving your clay soil will take a lot of digging, but will improve the structure of your soil making it easier to work. This is the way I improved and broke up my clay soil. Digging out and improving a small area or a planting hole doesn't work. The plant will be OK for a while but as it starts sending out roots that hit the hard clay, they will start circling around in the planting hole, just like in a flowerpot and will become pot bound. The other problem with just improving a small area, the surface water will drain from the clay into the area you have improved and subsequently water log the area. So it's best to improve an entire planting area, decide how much of the garden you want to improve and dig out any plants you want to keep. Followed up with the easier, but just as important work to continue improving your soil. 1 Cover the entire area with about 8" of organic matter. This could be anything that hasn't been treated with chemicals, compost from your compost heap, rotted manure or lawn cuttings. 2 Now the hard bit. This can be carried out over several days. Dig the organic matter into the top 10 inches of the clay soil, try not to compact the dug soil. Digging with a sturdy spade is the best way, but using a rotivator works OK too. Be careful if you are using a rotivator, it's likely to bounce off the compacted clay until you get the hang of it. The garden bed will end up a couple of inches higher when you have finished improving the clay soil and will settle down over a season. 3 Add more organic matter to the top of the garden bed each year, as the clay soil improves, this can be left on the surface for the worms to take it down into the clay for you. When is the best time of the year to dig clay soil? The best time of year to start working to improve clay soil is late spring or early summer (providing the soil is relatively dry) right after the winter frosts have finished and helped break up the clay and the clay has warmed up a bit. If you dig or walk on wet clay it loses its structure and can become puddled and compacted. How soon can I plant in the improved soil. As soon as you have recovered from digging it all in. And remember - try not to compact the freshly dug soil. Use a roll out track if you are wheel-barrowing over it. Here are 4 links to my articles that may help. Essential Minerals for healthy soil Magnesium, Potassium and Calcium. The best tools to use digging clay. Cheap spades and forks are not much use when digging clay soil, the handles bend and break and the fork prongs bend, I have broken more than i care to remember. For just a few pounds more I recommend the spades and forks I have listed here, most good gardening equipment shops stock them or you can buy now from Amazon. Don't try digging frozen, frosted or baked clay. It's impossible even with these tools. Grit sand for breaking up and improving heavy clay soil. It's extra work but worth spreading a one or two inch layer of grit sand across the clay soil before spreading the organic matter and digging the whole lot in at the same time. This will help break up even heavy clay soil. You will need to work at it over the years by repeating the process though. Baked clay is almost impossible to break up, rotivate or dig, it's easier to spread the organic matter and grit and wait until the worms have done some of the work for you. This is the Sharp Sand I use its composed of grains of rock, with a high percentage of larger grain sizes making it ideal for improving clay soil. Bulk bags weigh a minimum of 800kg, cost under £70 inc delivery. Do not use ordinary builders sand it will clog up the soil.